Backstreet Postcards: You say "Mais Non!" and I say "Mais Oui!" In Brussels there is a famous statue called Mannekin-Pis (Dutch for little man urinating - possibly). I have postcards, probably from the 1950s, of him dressed in a variety of uniforms. In this postcard he is dressed like a Grenadier Guard. 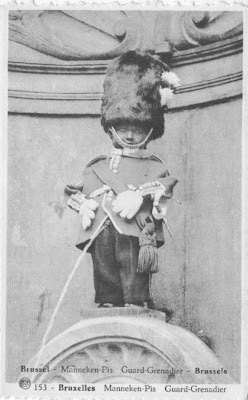 In England we have the changing of the Guard, but in Brussels they have the changing of the costume of the Mannekin.